Woohoo, I have two finishes to share for the Haven Circle of do. Good Stitches! 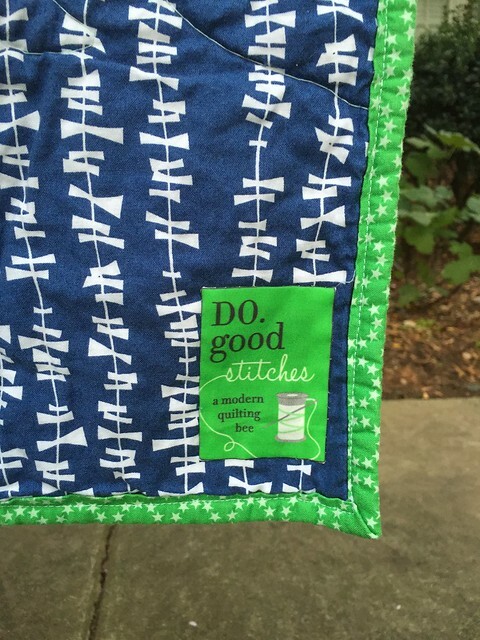 I became a quilter for Haven Circle late last year and this is the third quilt I have put together for our circle. 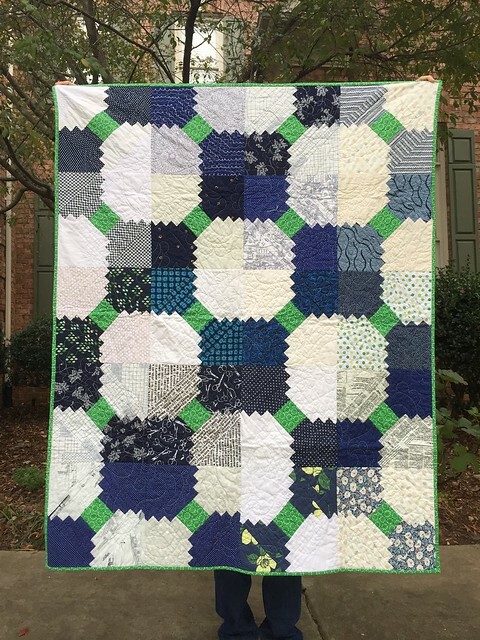 I've been a sewer (making two blocks a month) for many years, but finally felt ready for the challenge of being a quilter recently. You can find my tutorial for this Courthouse Steps block on point right here. 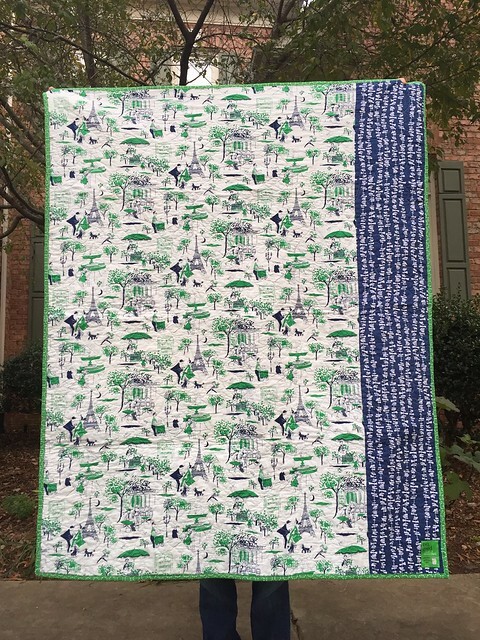 This quilt was built around this backing fabric - Michael Miller Gay Paris. 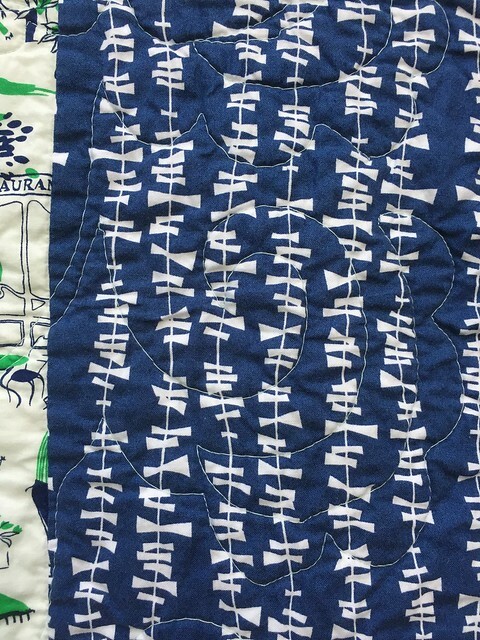 Then I got kind of hoard-y and decided not to use all of my yardage, finishing it up with a strip of the navy Lotta Jansdotter kite tails print. I worked on expanding my free motion quilting design bank and did a weird loop/dahlia design that works great, especially if you don't zoom in this close, lol! This one will be headed to Texas this week (with another one I will share tomorrow) to a battered women's shelter. Hopefully it will be a bright spot in a dark period of someone's life. It's very sad to think of the women in the situation. But also, hopeful that they can feel the love our little circle put into this. It reminds me of a quote from one of my favorite books, by Mary Doria Russell, "no matter how dark the tapestry of life that God weaves for you is, there is always a thread of grace." Looking for the grace, being the grace, that's what we strive for. Love how it turned out! Nice job! It looks wonderful! How do you find the time? I've loved this one from the beginning, and even more now that it's finished! Great design, nice finish! The recipient will be blessed.